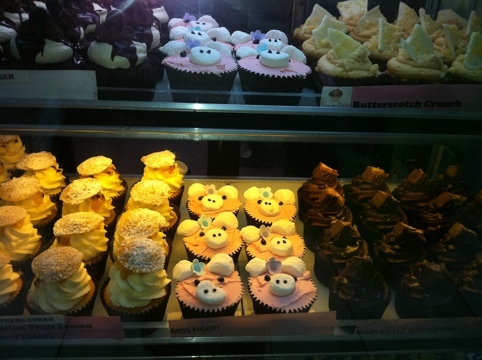 Take a look at these Miss Piggy cupcakes (from Cup-a-Cake, Chermside). They look easy enough to make, if you’re so inclined: 2 cut marshmellows for the ears and snout, dots of chocolate gel for eyes and snout and a sugar flower on top of your pink iced cupcake. I might take some of these to work to share. After all, we should take work seriously, but not ourselves.